Iteca Caspian LLC - More than 30 companies take part in Caspian Power 2015. More than 30 companies take part in Caspian Power 2015. From 2 - 5 June, Caspian Power 2015, the 5th Anniversary Caspian International Power and Alternative Energy Exhibition, the only trade event in the Caspian region on the energy industry, take place at Baku Expo Center. 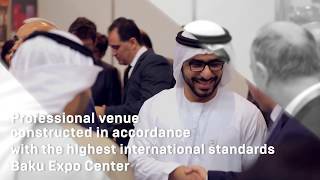 Caspian Power is part of a series of leading energy events held by ITE Group and is a proven brand among trade exhibitions. The event is officially supported by the Ministry of Energy of the Republic of Azerbaijan and the State Agency for Alternative and Renewable Energy Sources. More than 30 companies take part in Caspian Power 2015. Exhibitors come from Azerbaijan, Belarus, Romania, Turkey and many other countries. Among exhibitors are leading suppliers of energy technology: Alce Elektrik, Ardich Elektrik, Electroalfa, Germen Electronic, Goknur, Nobel Electric, Schneider Electric, STP, Vitta, the Kozlov Minsk Electrontechnical Plant and others. In addition to commercial companies, the State Agency for Alternative and Renewable Energy Sources also take part in the exhibition. Exhibits present automatic systems for technical and commercial recording of electro energy, LED lights, solar panels, LED indicators, lighting, a variety of cable and wiring products, self-supporting wire, switchgear and distribution equipment, modern energy-saving lights, transformers, insulators, electrical switches, and much more. Caspian Power 2015 will therefore present a unique opportunity to get to know leading representatives of the electro energy industry, get information on the latest technological developments and the strategic development of electro energy, as well as expand and establish new effective and mutually beneficial contacts and close prospective contracts. Iteca Caspian’s partners for their 2015 exhibitions include SafeLife – the security partner; the Greenwich Travel Club - the tour operator; official hotels Jumeirah Bilgah Beach Hotel Baku and Qafqaz Point Hotel; and AzExpoMontage the official stand builder. The exhibitions and conference are organised by Iteca Caspian and its partner ITE Group. ITE Group’s network of offices involved in the project includes ITE London, EUF (Turkey), GIMA (Germany), ITE Moscow, ITE Poland, ITE Gulf (Dubai), ITE China and ITE Malaysia.